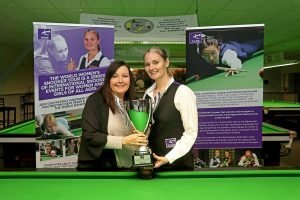 Reanne Evans claimed her 3rd title of the season having already won the European Women’s Masters and the Eden Women’s Masters, by beating her main rival Ng On Yee in the final. Both finalists had to survive last frame deciders in their semi-finals with Evans edging Wendy Jans and Ng setting up the final with a similar win over Nutcharut Wongharuthai. In the final it was Hong Kong’s Ng, the reigning World Champion, who took the first frame but then Evans dominated and ran out a 4-1 winner. 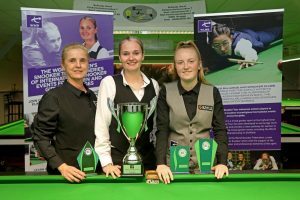 The seniors event was won by Caty Dahaene while the Under 21 and Challenge Cup trophies were won by Steph Daughtery.